Vietnamese actor Lien Binh Phat has won the Gemstone Award for newcomers at the Tokyo film festival. An impressive performance in film Song Lang (The Tap Box) won Phat the Tokyo Gemstone Award, festival organizers announced late last week. Tokyo International Film Festival (TIFF), established 1985, is one of Asia’s prestigious film festivals. This year, the festival took place from October 25 to November 3. Receiving the prize, Phat expressed gratitude to the festival, the audience and the film crew. "I am very happy to join such a grand international film festival for the first time, and this will be the motivation for me to continue on the movie path," he said. The Tokyo Gemstone Award is presented to new, potential actors and actresses from Japan and other countries. Besides Phat, Mai Kiryu (Japan), Nijiro Murakami (Japan) and Karelle Tremblay (Canada) were also awarded the prize. In Song Lang, a Vietnamese film centered around the relationship of a cai luong artist (Vietnamese folk opera actor) and a debt collector in the 1980s in Ho Chi Minh City, Phat plays the role of Dung, the debt collector whose family used to work as cai luong artists. Song Lang, directed by Leon Le, is Phat’s first film. 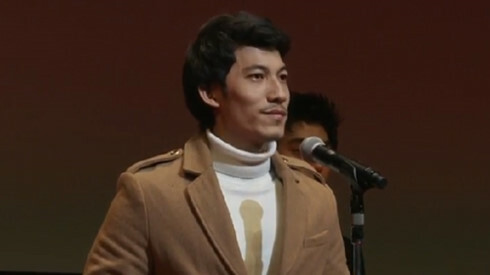 At the TIFF, Song Lang was listed among eight films in the Asian Future category and was nominated for Asian Best Film Award and The Spirit of Asia Award.